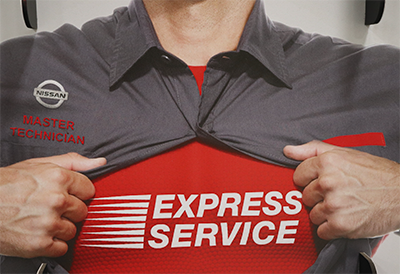 Express Service offers so much more than an oil change. We intend to provide you with vehicle diagnostics within 7-9 minutes of inspection start. At Nissan, we manufacture some pretty incredible vehicles. But we don’t just stop there. We’ve taken the same expertise we use in building an exceptional car and applied it to create a state-of-the-art service process for our technicians that is well-choreographed down to the smallest detail. Our number 1 goal is to keep your vehicle running like the day you purchased it. We want your car to run in peak condition, which is why we go over it from top to bottom every time you receive an Express Service Oil & Filter change. This leaves you with the peace of mind that your car is safe, reliable, and road-ready so you can focus on what’s important in life. 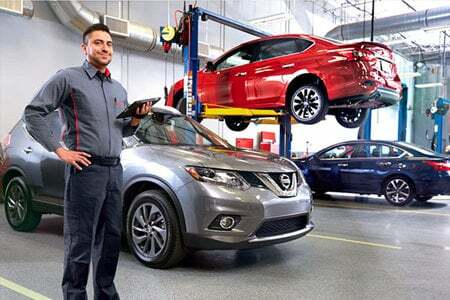 Our highly trained Nissan Express Service technicians perform a thorough 27-point inspection on your car. Lights, signals, wiper blades, horn, in-cabin microfilter, and more. Battery performance, and fluid levels including: oil, coolant, power steering, brake, washer, automatic transmission, and more. Brake condition, tire condition, tire pressure, rear shocks/suspension, drive shaft, muffler, fuel lines, fluid leaks, and more.